The biggest WordPress conference in Nepal, WordCamp Kathmandu 2019 was held last weekend. The event was all in all a huge success. The organizers and volunteers were on their toes to push the event towards triumph. And we’re very happy to see that there hard work and dedication paid off. DevotePress was one of the official media partners of WordCamp Kathmandu 2019. And with the official online media partner tag, it was our responsibility to bring all the latest updates for our visitors. Therefore, we live-tweeted the major highlights of the event. Follow us on Twitter to see them. In case for some reasons if you missed the grand event, you can stick with this article. We’re going to provide you a detailed account of the event including the venue, people, presentations, overall event, after-party, contributor day, and more. So, without any further ado, let’s get started. First of all, the venue. 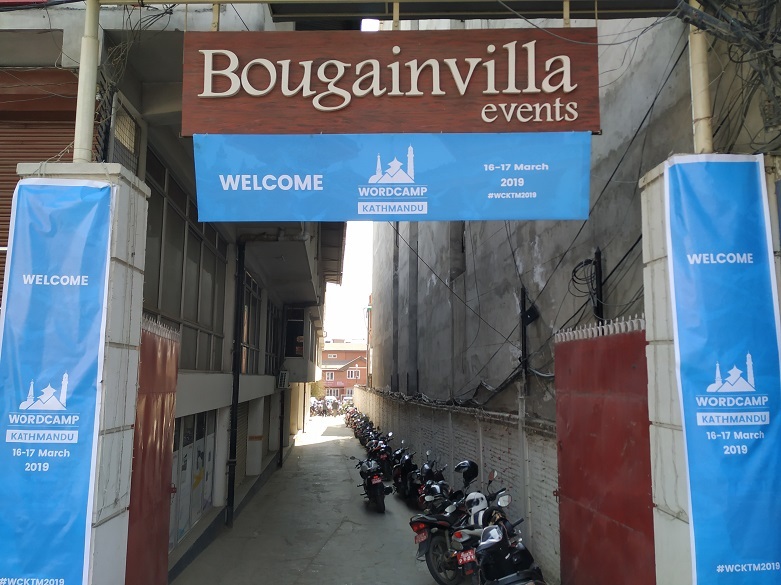 WordCamp Kathmandu 2019 was held at Bougainvilla Events in Tripureshwor, Kathmandu. The place included a parking space, however, it was a bit congested (maybe because almost everyone in that event had their own vehicles) and people were seen parking their motorbikes outside the venue as well. This time, there were three halls—Hall Action, Hall Filter, and the Lab. As usual, Hall Action and Filter saw a number of presentations and workshops, whereas, the Lab was for sessions like Gutenberg and Basic WordPress Beginner lab. To make the event a kind to remember, the organizers and volunteers arrived at the venue way many hours before the event started. The registration desk, sponsors’ desks, and swag store were all set outside the halls. The registration started at sharp 9 A.M. The attendees flooded into the swag store to grab their swags after the registration. Some of the most interesting stalls this time were of Catch Internet, weDevs, and WP Travel Engine. Catch Internet brought back its “Spin & Win” wheel, whereas, weDevs and WP Travel Engine introduced appealing lucky draw hampers. weDevs gave away a Google Home Mini for one lucky winner, which was one of the highlights of the day. Then as scheduled, the official event started featuring many new and interesting presentations by many speakers. As mentioned earlier, there were three halls—Hall Action, Hall Filter, and Lab. All of these three halls featured interesting presentations and sessions by inspiring speakers. Furthermore, we, the DevotePress team also had the chance to take interviews with a few of the speakers; you can later find them here. Besides all of these, WordCamp Kathmandu 2019 also featured a group photo session after the lunch break. The first day of WordCamp Kathmandu 2019 ended with closing remarks followed by distribution of Token of Appreciation to all the organizers, volunteers, speakers, and supporters for their time and effort. Time for some refreshment after a long day of WordPress conference—the After-Party. A Café, Tripureshwor was served as the venue for the after-party. It provided everyone a chance to hang out with fellow attendees, explore new ideas, and network after the WordCamp event. So, all in all, the first day of WCKTM2019 was concluded successfully. The second day of WCKTM2019, the Contributor day was also a great success with more than a hundred attendees. The registration started at 10 in the morning, followed by the introductory session. The introductory session was hosted by none other than the man himself – Mr. Utsav Singh Rathour. There were a total of three teams divided for the Contributor day: Theme Review, Support, and Polyglots. All of these teams were led by specific WordPressers; Theme Review team by Sandilya Kafle and Biplav Subedi, Support team by Abhishek Rijal and Regan Khadgi, and Polyglots team by Yoav Farhi and Sudeep Balchhaudi. All the attendees were seen very much involved in their respective teams and were contributing from their side. To conclude, WordCamp Kathmandu 2019 has officially ended and we are very happy to say it was a huge success. The hashtag #wcktm2019 got trending on Twitter during the two-day event. WordCamp Kathmandu 2019 gave everyone a chance to meet and network with a lot of new people, and learn a lot from talks. A big thank you from DevotePress team to all the organizers and volunteers for their effort and dedication. If you missed the event or any session you wanted to attend, you can later catch it up on WordPress.tv once they post it. Did you attend the event too? What was your favorite part? Feel free to drop your comments.